banana chocolate chip drop cookies, originally uploaded by laurasjoquist. Cookie number four is loved by the masses. If by masses you mean Jack and John. Jack gave it a huge thumbs up. He’s my best cheerleader and my biggest critic (if you have kids, you know what I mean), so a thumbs up is high praise indeed. On a completely different note, look at all those freckles. New York Black and Whites, originally uploaded by laurasjoquist. 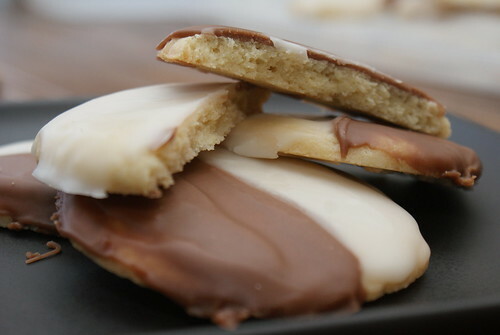 This is the third cookie recipe from the cookie book. Made in honor of our recent trip to New York. I wish I had tried one while we were in New York because this recipe is terrible and I don’t know if that’s how it’s suppose to taste. 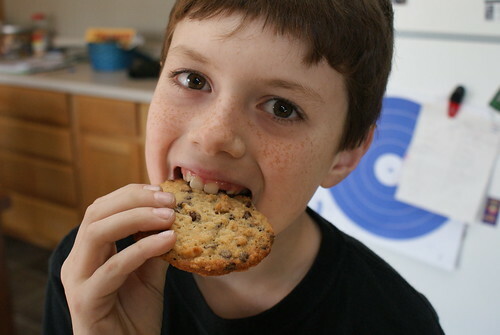 The cookie itself isn’t bad-kind of a soft lemon sugar cookie. But the frosting is horrible. John says they look pretty though. I’m thinking about going to the thrift store this week and dropping $10 or $15 dollars on some pretty display plates for cookie picture taking. Village Chess Shop game, originally uploaded by laurasjoquist. You might want to start reading about our New York trip way down at the bottom on the Times Square photo and work your way back. Or you can just read from here. Either way, it’s cool. 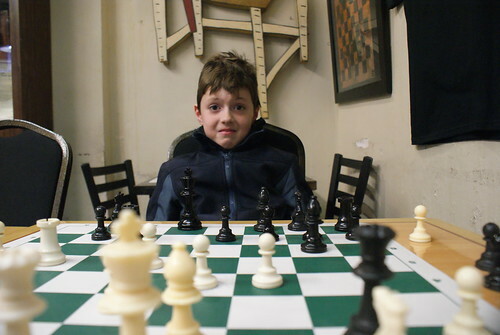 We ended our last day in the city with a trip to Greenwich village where we played a few games of Chess amongst the regulars at the Village Chess Shop. (Open 24 hours for your late night Chess needs.) 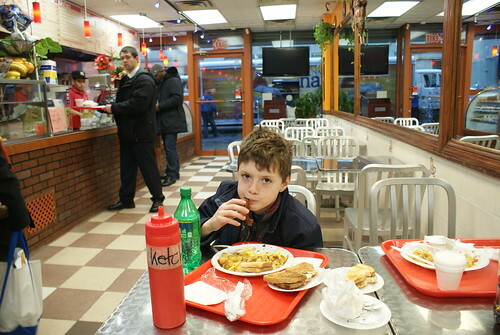 This was probably Jack’s second favorite place in New York. The Ramble Central Park, originally uploaded by laurasjoquist. The weather cleared up enough for us to explore more of Central Park on Thursday afternoon. 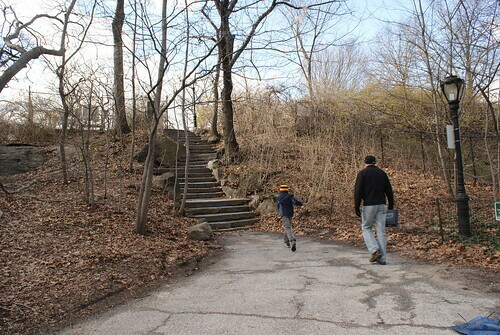 Jack was promised that once we got to the park he could run, jump and climb as much as he wanted. As long as he stayed out of the really muddy puddles and didn’t break anything. We only made it through about a third of the park. It’s huge. And amazing. Pizza in Hell’s Kitchen, originally uploaded by laurasjoquist. We spent Thursday morning on board the USS Intrepid a retired air craft carrier that now houses an air and space museum. Jack says that wandering around the flight deck looking at jets and playing with the interactive displays was the highlight of his New York trip. Score one for mom and dad. 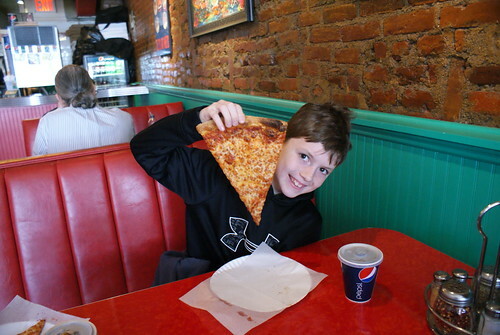 Afterwards we stopped for lunch at Two Boots Pizza in Hell’s Kitchen were Jack conquered a slice of pizza the size of his head. 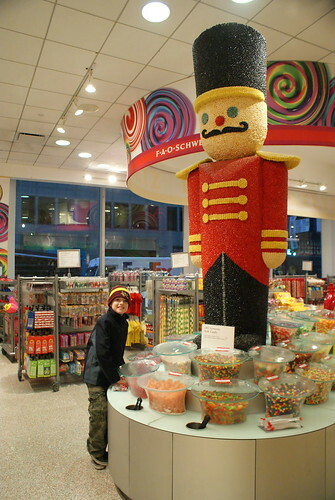 FAO Schwartz Jelly Bean Soldier, originally uploaded by laurasjoquist. We couldn’t go to Manhattan without visiting FAO Schwartz on 5th Avenue. I mean what kind of parent would I be if I didn’t take my kid to see giant jelly bean soldiers and $300 teddy bears? 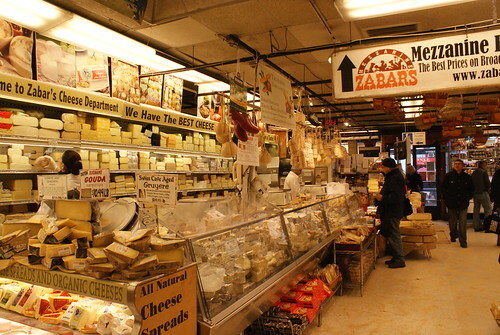 Zabar’s Deli Cheese Counter, originally uploaded by laurasjoquist. When we go on vacation I like to visit gardens. Jack likes to find good playgrounds. John likes to visit the local grocery store. So after reading through tons of literature on New York, I found Zabar’s Deli for him to explore. Yes, you should go here. But wait until summer when you can pack up for a really awesome picnic in the park. 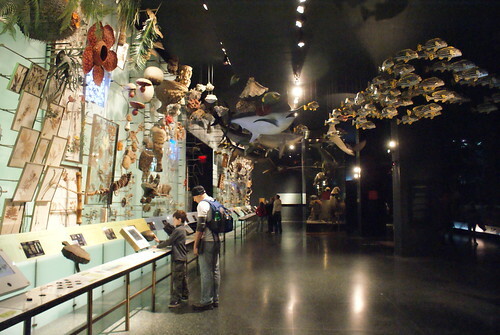 Hall of Ocean Life, originally uploaded by laurasjoquist. The Weather was not our friend on Wednesday. We got a mix of rain, snow and sleet all day long, so we spent most of our time at the American Museum of Natural History. This place was spectacularly huge and while we tried to hit all the major sights we only managed to get through half the museum. The displays that we did see were incredible. This is by far the cleanest, most well thought out museum I’ve ever been in. The Hall of Ocean Life was my personal favorite. Breakfast at El Pio Tio Brooklyn, originally uploaded by laurasjoquist. Our first night’s dinner in Times Square cost us the outrageous price of $82 for some chicken wings, and sandwiches. Lucky for us (or maybe because I’m such a good planner) we stayed in Brooklyn and after that first night found some awesomely tasty and cheap eats near the hotel. El Tio Pio just around the corner had $3 breakfast plates that rocked. We managed to eat for the rest of the trip for about $20 a meal for the three of us. Until we splurged on a vegetarian place in the village that also rocked.